Sarah Gilman arrived in Paonia for a winter internship, still smiling after a summer of trail work on Colorado’s 14,421-foot Mount Massive. A native of Boulder, Colo., Sarah is no stranger to the Paonia area. 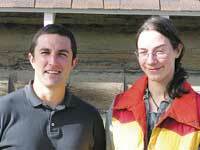 She spent two summers working at the Rocky Mountain Biological Laboratory, just over the hill in Gothic, and visited HCN in 2002, during her travels with Whitman College’s "Semester in the West" program. Now, equipped with degrees in art and science, she sees writing about the West’s environment as a way to bridge the gap between the two fields and also make a positive impact on her home region. As she takes in a winter on the Western Slope, Sarah is also awaiting an important delivery: a new loom. She apprenticed with a weaver in Oregon last year, and will soon be putting a colorful array of yarn to use. New HCN intern Brett Wilkison describes himself as a born wanderer with an affinity for the West. He credits his nomadic urges and love of place to the combination of road trips and an oft-visited cabin in northwestern Montana, where his family taught him to fly-fish. Brett grew up in Nipomo, Calif., where he witnessed firsthand the failing health of coastal ecosystems. His grandfather had fished the steelhead trout runs, but by the time Brett learned to fish, the runs had collapsed. After Brett graduated from the University of California at Berkeley in 2000 with a degree in history, he returned to his hometown to work on watershed restoration and land conservation. Since then, Brett has pursued environmental journalism, interning at Sierra magazine and co-editing a wheelchair trail guide to the San Francisco Bay area for the Coastal Conservancy. He plans to start graduate studies in journalism next fall. Robert E. "Bob" Wolf, 84, an expert on forest economics, died Dec. 24 at his Maryland home. Wolf held positions with the BLM, the Forest Service, and other agencies. He was involved with nearly every significant piece of federal public-lands legislation from the early 1950s to the early 1980s, including the National Forest Management Act and the Wilderness Act. In an e-mail last October, which he shared with HCN, Wolf chastised Mark Rey, the undersecretary of Agriculture who now oversees the Forest Service, for the administration’s "abuse of the court system." The Forest Service, in response to a California court ruling, had shut down a host of activities, including firewood gathering, saying that such activities required public review (HCN, 10/31/05: Forest Service tries to teach greens a lesson). "Your ploy backfired," Wolf wrote. "Congress didn’t leap to overturn Judge Singleton’s decision. Instead, senior members wrote that you were playing a game." Rey’s response to Wolf’s note began: "Normally I value or at least enjoy your missives … This would be the exception."